Aubergines are great for stuffing and this recipe combines scooped-out aubergine flesh with a vegetarian mince to create a rich filling, all served in a baked aubergine shell. This vegetarian recipe can be adapted for people with chewing or swallowing problems by blending ingredients to the required consistency. 1.Preheat the oven to 150°C. 2.Dice the onion, paprika, courgettes and the mushrooms. 3.Cut the aubergines in half lengthwise, remove the flesh of one half and dice. Add to the other the vegetable mixture. 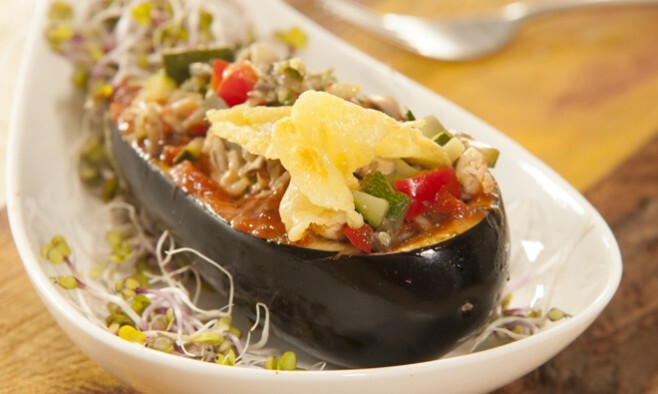 4.Brush the inside of the hollowed aubergine with olive oil and place in a buttered oven dish. 5. Cook the halved aubergine in the oven for 15 minutes. 1.Fry the diced vegetables in heated olive oil until glazed. 2.Add the quorn mince and season with salt and pepper. Add Provençale herbs or Provençale taste-booster and chopped garlic. Stir well. 3.Add the tomato purée, stir well and add the vegetable stock. Bring to the boil while stirring. 4.Immerse half a lemon (with skin) to the bottom of the cooking pan and leave to simmer for 20 minutes on a low heat. 5.Cook the quinoa according to instructions on the package. Replace the quorn mince with seitan or tofu for alternative vegetarian options. Or use pork or poultry mince for a meat dish. Use the hollowed baked aubergine as a ‘serving mould’: stuff with quinoa, add a layer of mixed ratatouille and top off with the ground quorn mince. Drizzle with the creamy ratatouille juice. 1.Remove the half lemon out of the sauce. 2. Add the diced tomato and bring to the boil while stirring. Leave to simmer on a low heat for 5 minutes. 3. Season with salt and pepper, Provençale taste-booster or green pesto and take off the heat. 4. Fill the hollowed aubergine with the ratatouille. 5. Sprinkle grated parmesan cheese over the filling and serve. 1. Take the required volume of prepared ratatouille from the cooking pan and leave to drain in a sieve. 2. Heat the ratatouille juice and thicken to sauce consistency with an instant binder. 3. Mash, crush or mix the ratatouille to consistency level required. 4. Use the cream sauce for moistening at level 5, 4 and 3. 5. Per portion of quinoa, fry 50g quorn mince golden brown in olive oil, season with 1 teaspoon Provençale tastebooster or herb mix. Here too, use the creamy ratatouille juice for crushing or mixing the mince.